I am perfectly happy with the scone recipe I found in Martha Stewart Baking Handbook. In fact, it's the recipe I always go back to whenever I need to make scones. There are other recipes that I have tried with satisfactory result, but they were too rich for my lifestyle. You see, heavy cream is used in the traditional scone. Though they are tender, sweet and everything that a good scone should be, I feel a bit guilty to eat them on a regular basis. Martha's version on the other hand, uses buttermilk. It gives the scone an equally tender and light texture, which I like, plus something more. A little something that you can't pinpoint, but leaves you going "Hmm..."(in a good way, of course). In short, I am contented with my reliable recipe. So why risk my previous ingredients to try another new recipe? Because this recipe uses buttermilk too! You know, "great minds think alike"! I believe whoever this person is, she must be thinking the same thing as Martha, and me! (ahem) And that is to cut down on the calories of the scones. It's a recipe for Meyer Lemon and dried blueberry scones. I love anything with lemon! I love it in cake, I love it in cookies, but how could I not think of adding it to my scones?! Clearly, it showed that I am not a creative person. Anyhow, I knew I got to do make the scones immediately. Eventhough I didn't have any dried blueberry on hand. Luckily, we were on our way out, so I managed to grab a bag of it from Trader Joes! But there's still another problem. The recipe used self rising flour. I know there's a substition for it using all purpose flour and baking powder. But the buttermilk is an acidic ingredient, which it required something alkaline to neutralise it. Or the scones may tasted very sour-y. So I shall add some baking soda. In that case, some salt too. It's a chemistry thing, which I shall spare you the detail. In a gist, I need to make sure that the scones will rise beautifully, and taste right. The recipe doesn't require any egg which I find weird. So I added one egg in my modified recipe. I get more and more confused with the use of ingredients in this recipe the more I think about it. It's like the kind of organic chemistry exam questions I got in Uni days. At the first glance, you thought the question was pretty straightforward, but when you started to answer the question, it just doesn't seem right. Anyway, I baked the scones adopting Bon Appetit concept with many modification. The scones tasted a bit bland. Although the perfume of lemon filled my apartment while the scones were baking, I could hardly taste it in the final products. 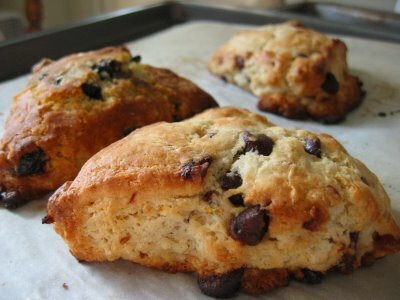 The concept of putting lemon and dried blueberry in scone is excellent, but the recipe definitely needs more adjustment. Yesterday, after baking a batch of orange chocolate oatmeal cookies, I have some orange zest leftover. So it gave me a perfect excuse to try another version of the lemon and dried blueberry scone. This time, I used orange zest with dried cranberries, and added in some chocolate chips. Since I was experimenting with the recipe, i decided to omit the egg, as the recipe advised and decreased the amount of baking soda. This time, it is much nicer. Although the orange flavor isn't obvious enough to be detected. That is a simpler problem to solve. I will either add more zest or add a tablespoon of orange juice next time. I know this is a boring entry for anyone who isn't in the mood to make scones. But in case any of you, my friends want to know what I have been up to lately, this is the kind of stuff that's is going on in my mind right now. Of course, I am also thinking of what to bake for OCT's lab meeting tomorrow. And what's for dinner later! Note: I halved the recipe, and used 1.5 cup of all purpose flour+ 2 tsp baking powder + approximately 1/2tsp baking soda + 1/4tsp salt in place of self-rising flour.Added 1/2 cup of chocolate chips and 1 tbsp orange peel in the second attempt. Finally I found someone who is loving scones as much as myself. My family doesn't like scones but I really crazy about it. It's nice to have someone enjoying the same food as me. I normally use skim milk if I couldn't get buttermilk. It works well too. But, surely buttermilk will always give better texture.